I finished reading Thundar, Man of Two Worlds, last night and this is my promised book report. As always, I will keep it short and try to avoid spoiling it for folks who want to read the book themselves. First and foremost, the book is an homage to the work of Edgar Rice Burroughs. It was published in 1971, but reads more like something written in the 1930s (for good and ill). The author, John Bloodstone, is really writer Stuart J. Byrne. Byrne wrote pulp sci-fi back in the 1950s and 1960s, wrote a couple episodes of Men into Space (which I love) and a couple movies in the 1970s, and later wrote translations of Perry Rhodan stories. The book concerns the adventures of Michael Storm, who is a mountain climber and swordsman (all such characters need to have a knowledge of sword fighting before they wind up in a swords and sorcery setting) who winds up in the far future through his reckless daring. Once in the far future, he gets into all sorts of trouble – again, I don’t want to get into specifics, because blabbing about them would ruin all the good (which is little) this book has to offer. Unfortunately, the book lacks ERB’s creativity, or his pace reminiscent of old movie serials, with each chapter ending with the protagonists in a terrible situation, and the next beginning with how they escaped it … only to fall into another by the chapter’s end. You get a little of this in Thundar, but not enough, and like most fan fiction it doesn’t completely gel. The book was clearly intended to be followed by others which, to my knowledge, did not materialize. 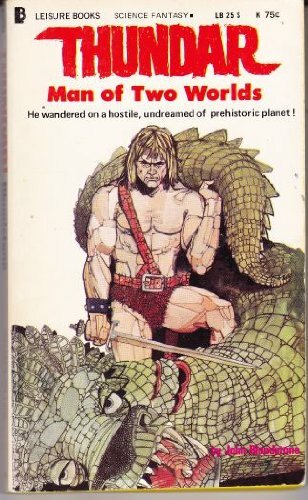 Now, as to whether this book could have influenced the Thundarr the Barbarian cartoon (1980-1982) … maybe, but only in very small ways. If it had any influence, I would guess it was a matter of the creators of the cartoon having a hazy remembrance of the book. 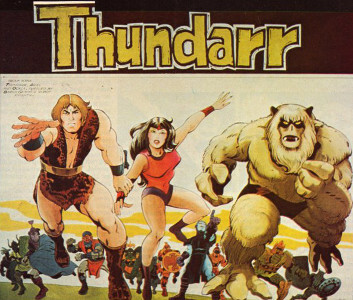 Cartoon Thundarr looks a little like the guy on the cover, but the resemblance ends there. There is no Ookla the Mok (and the Mogg in the book can only have influenced the word “mok”, and nothing else about old Ookla), though there is a “dawn man” called Koom (and he’s pretty cool – more Koom would have made for a better book in my opinion). There is no Princess Ariel (though there is a Princess Cylayne, who does help Thundar and mostly serves as a Dejah Thoris stand-in to motivate our hero). There is some super science, but no sorcery. There is no sun sword, though there is a blade of Damascus steel. There was a catastrophic cosmic event that screwed up the Earth, but the story is set a million years in the future, so there are no remnants of the 1980s. In short … very little influence. There is suggestion that this world was the origin of the advanced peoples of South America, but the people we meet in this future earth don’t apparently resemble them at all – I kept expecting this and was disappointed. Can gamers get any inspiration from the book? Maybe, but I doubt it. The world building is pretty simplistic. You have mountains and a jungle and an inland sea and two rival cities on its shores, and not much else. I would expect that every DM’s first stab at making up a campaign world was as good as anything you would get in this book. There’s almost a cool hook involving technology’s influence over the world, but it remains vague, perhaps to be dealt with in more detail in the later books that didn’t happen. Even if technology had been more fully explained, it mostly shows up as a deus ex machina, which wouldn’t be too handy to a DM writing a campaign world. The way Michael Storm ends up in the far future could be copied for a game – it was pretty fun, but not revolutionary. Well…if nothing else this made me want to rewatch the old series!